Think of Thanksgiving dishes you most dread and mashed rutabaga probably springs first to mind. What was that vaguely bitter orange stuff Aunt Tilly was so fond of anyway? Outside Minnesota, rutabaga have all the appeal of a dead skunk on the highway. Or do you have to be Scandinavian to love this under-appreciated root? Rutabaga have such a long love affair with the northern countries they’ve acquired the nickname “Swedes.” In fact, a couple of years ago while I was traveling the U.S. documenting our school lunch disaster the Swedish government invited me to Stockholm to sample the school food there. Invariably I encountered cafeteria “salad bars” dominated by cabbage, potatoes and rutabaga prepared a dozen different ways. As far as Swedish schools are concerned, kids can’t hardly get enough potatoes and rutabaga. But can a root vegetable the size of a slow-pitch softball really be edible? I wasn’t sold until I stumbled upon a February 1991 issue of the late Gourmet magazine in which an entire section was devoted to recipes for rutabaga and its smaller, paler cousin, the turnip. Was it a gag? I wondered. Apparently, I had a thing or two to learn and one recipe in particular has stuck with me all these years later: rutabaga souffle. Turns out souffles are not so terribly difficult as legend would have it. You do need a few mixing bowls and a straight-sided souffle dish certainly helps. But if you can beat egg whites to stiff peaks–well, you’re almost there. Souffles can be sweet for dessert or savory for a side dish. Make a roux with butter and flour, add milk and the flavoring (in this case mashed rutabaga) and fold in your beaten egg whites. Voila! Next time you raid your root cellar, see if you don’t have a rutabaga yearning to be elevated into something sublime. This is high season for storage vegetables. Rutabaga are not terribly difficult to grow, either. We harvested them out of the vegetable garden we kept in front of our house in the District of Columbia, just two miles from the White House. Oh, and the greens are delicious as well, I discovered. I started using them instead of spinach in my lasagna. For rutabaga souffle, you’ll first need a souffle dish, buttered and dusted with bread crumbs. Fit a collar around the dish that rises at least 2 inches above the rim. We use aluminum foil and a paper clip for this, or parchment paper and staples. To make the souffle, peel and cut 1 rutabaga into 1 pound of cubes. Place in a large saucepan, cover generously with water and season with salt. Bring to a boil, then lower heat, cover and continue to cook until the rutabaga is very tender. Drain and squeeze the rutabaga through a ricer (or mash) into a large mixing bowl. Set aside. You can use the same saucepan to make your roux. Melt 4 tablespoons butter over moderately high heat. Add 4 tablespoons all-purpose flour, mix well and cook, stirring with a whisk for a couple of minutes. Lower the heat if necessary. You don’t want the flour to brown. Slowly whisk in 1 cup milk. Bring to a boil, then lower heat and cook, stirring frequently, until the roux is thick. Add 3 ounces sharp cheddar cheese and stir continuously until the cheese is completely melted. Season with 1/2 teaspoon salt (or to taste) and a generous pinch of freshly grated nutmeg. Remove from heat to cool a bit, then stir in 4 egg yolks, one yolk at a time. Adjust seasoning. Scrape the roux mix into the bowl with the riced rutabaga. Mix well and set aside. In a separate large mixing bowl, whisk 6 eggs whites with 1/4 teaspoon cream of tartar into stiff peaks. Fold 1/4 of the beaten whites gently into the rutabaga mix. Add the rest of the whites to the rutabaga mix and fold these in until completely incorporated. Use a light hand with the folding, as it is the air you have beaten into the whites that makes your souffle rise. Pour the mix into the prepared souffle dish and place on a baking sheet in a 325-degree oven. Bake for approximately 70 minutes, or until the top of the souffle is golden and the souffle is cooked through in the middle. We made this souffle last night and served it with dinner next to a Caesar salad. Even daughter liked it, judging by the second helping she took. 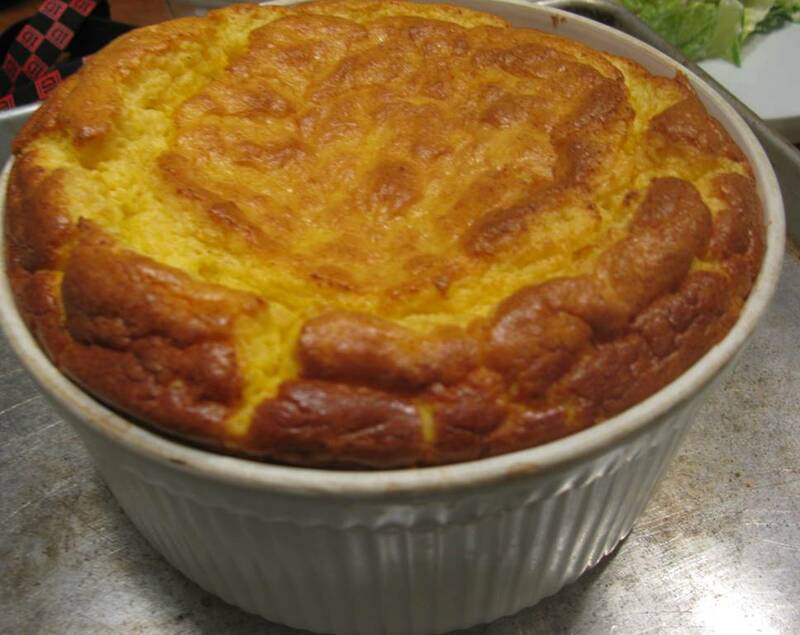 I guarantee that if you make this souffle, you’ll become a rutabaga lover as well.